The green is our current job market. 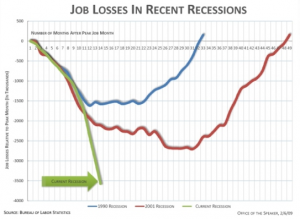 This graph tracks absolute, not relative, job losses. Since the population of the US rises over time, this graph is not nearly as informative as it looks. Agreed. As with any graph I post, take it with a grain of salt. I’m no economist and I can’t vouch for the methodology or motives behind the numbers. However, the thing that struck me, is we’re early on in this recession, and yet the job losses are greater and seemingly only accelerating.